Is Mary, the mother of Jesus, truly a mirror which reflects in the most perfect way possible to humans the Divine attributes or is it more true to say that she is a mirror which reflects mostly the work of the Catholic imagination? I would argue that to some degree that she is both and that moreover the two things are really one thing approaching the same object from different angles. Critics of the Church often assert that the Mary of the Gospels and Catholic Mary are two very different figures with little in common. The person whom the Church venerates under that name is based less upon the Bible than it is upon fantasies, legends, speculation and liberal borrowings from pagan cultures. Most arguments which have the power to persuade large numbers of people usually contain an element of truth and that is so here. I propose to demonstrate briefly what is false in the allegation and then to suggest that what is true in it does not contain the meaning that the critics suppose that it contains. First then, the references to our Lady in the New Testament. No woman has more references made to her in the Gospels than Mary although that still means that the total number is quite small. As I demonstrated in my earlier series The Bible & The Virgin however the Evangelists had the ability to compress masses of information into very few words. Close consideration of the verses will enable a person to learn explicitly and deduce implicitly much that the Church holds to be true regarding the Mother of our Lord. The same applies to the appearance of Mary in the Acts of the Apostles and the figure of the woman clothed with the sun in Revelation (Apocalypse 12) whom it is not unreasonable to identify with the Theotokos. The Church also holds it to be axiomatic for Christians that they should always read the Old Testament through the lens of the New. This means that we see in the OT much which prefigures or foreshadows the new dispensation in archetypal form. Included in this are any number of figures, like the bush that burns without being consumed or the Ark of the Covenant or Rachel the mother of Israel, which refer to Mary. 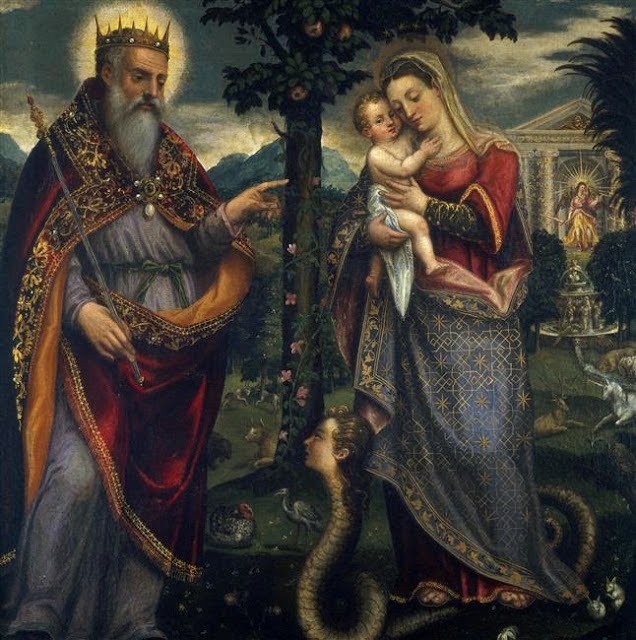 Perhaps above all there is the figure of Eve and the Protoevangelium in Genesis 3 I will put enmities between thee and the woman, and thy seed and her seed: she shall crush thy head, and thou shalt lie in wait for her heel. (Gen 3:15) Taken together all the references in Scripture which can be readily understood to refer to our Lady fill up in great measure the figure of Catholic Mary and identify her with the historical Mary of Nazareth. It remains true nonetheless that the image of Mary which Catholics hold in their hearts and minds with such devotion is in part based upon extra-biblical sources but that is hardly the devastating critique that its opponents suppose it to be. The Church has never held it to be a truth that the Bible is the only resource which gives us accurate information about the revelation of God to Man and the Bible indeed makes no such claim for itself. The Sacred Traditions passed on by the Apostles to the faithful are of at least equal value and the two things balance each other, nothing in Tradition can contradict Scripture and nothing in Scripture can contradict Tradition. We can see, then, from the very ancient liturgies and prayers of the Church and the writings of Early Church Fathers much material which is now incorporated into the Marian cult of the Church. A third pillar to the understanding of revelation which we possess is the use of reason. By applying reason to Scripture and Tradition we can that deduce certain things must be true or can be accepted as being true without contradicting either of the other two. Hence speculative theology adds another element to the picture that we can form of our Lady. Where these things, Scripture, Tradition and Reason are in harmony with each other we can have some confidence that their collective wisdom forms a truth and so what they tell us about Mary means that the figure whom the Church honours is the same as the young woman who first heard the words of the Archangel Gabriel some two thousand years ago. There is a fourth source to our picture of the Mother of God which proceeds from the reports that over the centuries many visionaries have given of their encounters with her in visible form. These constitute what are called 'private revelations' to distinguish them from the age of public revelation which ended with the death of the last Apostle. At that point all that was necessary for a saving faith had been made known to Man and nothing could be added to or taken away from it. What private revelations, insofar as they are authentic, do is recall to mind this or that aspect of revelation which it is particularly necessary for a particular epoch or society to remember. Some supposed revelations are spurious and consequently are rejected by the Church. Others which are consonant with Scripture, Tradition and reason are considered worthy of belief although the Church does not insist that they be actually believed in any case. From this deposit of private revelations many Catholics draw their image of Mary as a person among us with whom they can and do form a strong personal attachment and devotion. And this is the figure who can be described in a sense as the mirror of the Catholic imagination. The word 'smile' here is a central part of the whole encounter. Bernadette later recalled the first apparition in these words She smiled and smiled at me, beckoning me to come closer as though she were my mother, and she gave me to understand in my soul that I was not mistaken. One of the factors which began to convince the people of Lourdes about the apparitions was the sudden transformation that would come over Bernadette's face when she saw the Lady. The visionary was transfigured and a smile transformed her appearance in a remarkable way. This was a reflection of the one which she saw before her proceeding from Mary. What does this simple thing tell us about the Mary of Catholic imagination? The smile reassured Bernadette who was frightened. It proceeded from the kindness of the Lady. The perfection which Catholics seek in their lives begins with kindness, the kindness they receive from Jesus who died for them and calls them to Salvation, the kindness which should overflow from them casting its light upon all who surround them. In Mary they see that quality, it has flowed from Jesus to her and she mirrors it, it flows from the faithful to her in earnest desire and she reflects that also and it is not two types of kindness but one. The smile is a product too of happiness. Who can be happier than the one who is closest of all to Jesus, who loves Him with a perfect love and is sure that she is loved in return? Mary's life had more than its share of sorrow, the exile in Egypt, losing her Son in the Temple, seeing the hatred and envy His mission provoked, sharing in the agony of His Passion and Death yet that underlying solid happiness never vanished and never could vanish, founded as it was in the strongest of loves. The faithful too know sorrow and loss and they too love Jesus. Mary reflects the love she has received from above and she reflects also the earnest desire of the faithful to share in that love and they are not two loves but one which intersect in her slender graceful figure. A smile shared is more than a smile doubled. Our Lady of Lourdes shared her smile with Bernadette who smiled in return, it was an act of companionship, of friendship of sharing it established a unity. The smile of Mary is a reflection of her union with Jesus her Son and it is a reflection too of the earnest desire of the faithful to be united through Mary with Jesus. And union always means one. Here there is no doubt that the Mary of the Gospels and the Mary of the Church are one and the same. Here too we see that, as the prayer says she is the dwelling place of the Holy Spirit the same Spirit which inspired the Canticle of Mary inspires her choice of little Bernadette Soubirous. In this preferential option for the poor our Lady is a reflection of the Divine preference and she is a mirror of the desire of the faithful poor to be included in the Kingdom and these two are one, the desire to save and the desire to be saved which intersect in the person of Mary. It is of significance that not only did Mary choose the poor despised one but that she treated her with a tender courtesy. At their third encounter Bernadette reported that our Lady said Would you have the graciousness to come here for fifteen days? This is the august Queen of Heaven, the Mother of God speaking to a girl that lived in a disused prison cell considered unfit for prisoners but suitable for the Soubirous family. Mary spoke as to an equal for in the young Saint she recognised one for whom her Son had willingly become incarnated and suffered the ignominy of the Cross. More than that in making a request and not issuing a command our Lady reflected perfectly the respect that God has for human freedom. And in coming to Lourdes she reflected also what the response of the faithful to the requests of God looks like. The Mary of the Gospels who said Behold the handmaid of the Lord is the same as the Mary of the faithful who comes to do the work of the Lord in the midst of His people. In saying you are the star of the morning, the gate of Heaven the prayer recalls to our minds that the name that the Lady of Lourdes called herself by was this- 'I am the Immaculate Conception.' The first light that hinted at the coming of the Son who would dispel all darkness was that moment when Mary was conceived in the womb of Saint Ann. For the first time since Eve a human person entered into life who was not under the dominion of sin. When the faithful look upon Mary they see reflected their own earnest desire for liberation because in Mary they see a mirror which shows that freedom from darkness which our Lady shared with Jesus because of Jesus. And the freedom desired is not a different freedom from the freedom achieved they are the same thing viewed from different angles. In describing Mary as the first resurrected creature the prayer recalls that our Lady is the pioneer that shows us the destiny of all the faithful, to follow Jesus body souls and spirit into the joy of the new heaven and the new earth. She is the mirror in which we see the gifts that God showers abundantly upon His beloved ones and she is the mirror in which the faithful see that life which they so earnestly desire to enter in upon and the two things are one. I could go on, the Apparitions reveal so much more about prayer, sorrow for sin, love of the Church and many other things besides. But I have wearied you enough and, I hope, made my point too. The Mirror of Divine Perfections and the Mirror of the Catholic imagination reflects the same things because they come from the same source. It is the work of the Holy Spirit who creates in the faithful what I have been calling imagination and what you might equally call the Catholic faith. There are those who think that the word 'imagination' means 'making stuff up' or 'fantasising' but that does not exhaust the possibilities of the word. The active imagination may do these things but there is a passive imagination also. This receives impressions and works them into forms which are understandable to the mind by blending different elements each of which is real. We see an example of this in the parables of our Lord who took truths and wove out of them striking images which inhabit the mind and heart and make those truths live in a way that bare sermonising never would. The Mary of the Gospels is real and identical with the Mary of the Church and with the Mary of the authentic visionaries. The Catholic imagination is no more than the act by which the faithful blends these different impressions as they come to them and form them into a unified picture. It does not create a new Mary it makes the one Mary present to us in a vivid way. Speculative theologians take concepts derived from revelation and distil them down to ideas which the combine to create dogmatic statements or doctrinal propositions. Speculative theology is the imagination of the intellect, devotion to Mary is the theology of the heart. Theologians and popular sentiment can sometimes err by making over extravagant claims or by failing to give all that is due to the Mother of God. In both cases the error can be corrected through submitting to the judgement of the Church which has been granted the authority and given the guidance to be wise with a spiritual wisdom in such matters. A final word about the apparent contrast between the Catholic Mary and the Mary of the Gospels. Critics constantly make the error of confusing the titles with the person. They see our Lady referred to as Queen of Heaven, Queen of the Angels, Refuge of Sinners, Mediatrix of All Graces, Help of Christians, Mother of Mercy, our life, our sweetness, our hope and so on. They actively imagine that we attribute to the person who holds such titles all that they would imply upon earth of pride and inaccessible splendour. But Catholics see no contrast between the most glorious creature in God's creation being at the same time the humble young Nazarene maiden and also the kindly figure who smiled so sympathetically and encouragingly at little Bernadette. Mary is not her titles, they do not alter her but she, because she is in truth the Mirror of Perfection alters instead our understanding of what it means to be queenly, to be honoured, to have power. 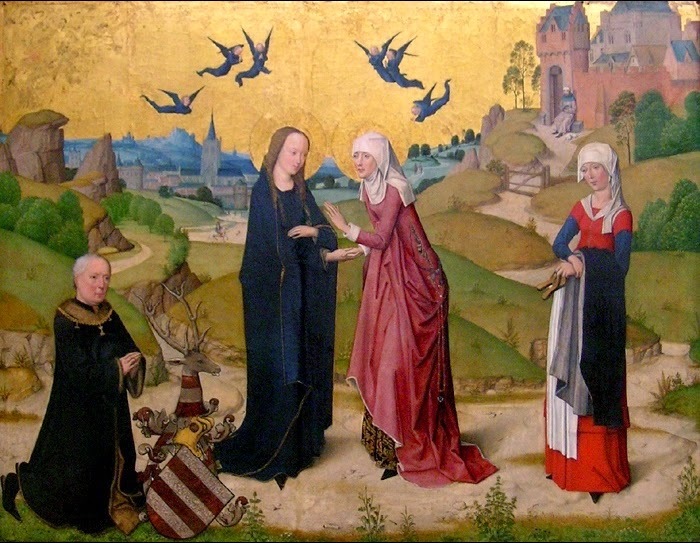 It is not imagination but truth which tells us that it is only humility and love which enables a person to fulfil their purpose as a person and Mary as Queen and as the young mother in flight to Egypt is never anything other than the perfect image of love and humility. Follow @stevhep on Twitter, Google+ and Tumblr. Follow Catholic Scot on Pinterest. Like the Catholic Scot Blog Page on Facebook.